UHCL President William A. Staples, from left, joins the honorees at the 2014 Alumni Celebration — Marilyn S. Sims Leadership Service Award recipient Ann Hammond; Outstanding Professor Award recipients Professor of Decision Sciences Ken Black and Assistant Professor of Sociology Stephen Cherry; Distinguished Alumni award recipients Kevin C. Wooten and Carolyn Ann Lightfoot; and Associate Vice President for University Advancement Rhonda Thompson. University of Houston-Clear Lake Alumni Association celebrated the accomplishments of UH-Clear Lake’s distinguished alumni and professors at the 2014 Alumni Celebration in October. Lee College Innovation in Teaching and Learning Technology Conference Founder and Program Chairman Carolyn Lightfoot. Retired NASA Program Analyst and Clear Creek ISD Past President of the Board of Trustees Ann Hammond received the Marilyn S. Sims Leadership Service Award and UHCL Assistant Professor of Sociology Stephen M. Cherry and UHCL Professor of Decision Sciences Ken Black were honored with the Outstanding Professor Awards for their work both inside and outside of the classroom. 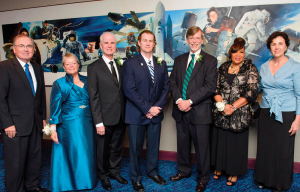 Founded in 1981, the UHCL Alumni Association’s mission is to enhance the pride and loyalty of its alumni and community, promote the interests of the university and encourage lifelong relationships with UHCL.